I’ve read a couple of articles recently that talk about the “phenomenon” of women not wanting babies. Not, not wanting them at a particular point in life.Not wanting them at all. The first article I read spoke to a woman who has been fighting for sterilisation rather than continuing to use contraception (which, let’s face it, can and does fail). She’s childless and knows she doesn’t want children. Ever. Yet she keeps getting pushback from health professionals who don’t want her to make that permanent decision. Now, I’m firmly in the no kids camp. The idea of being a mother does nothing for me. I have no aching womb, no maternal instincts, and no desire to push a human being out of my front bottom. So obviously I’m going to defend her position and stand up for her. But actually, regardless of your stance, isn’t it pretty disgusting that a grown woman with years of life experience is being told she doesn’t know her own mind? Complete strangers think they know her better than she knows herself? Why is a woman’s personal view on procreation such a big deal? Why is it everyone else’s business? And why, in this day and age, are we still expected to be baby makers, and frowned upon when we express a different view? I appreciate that women who don’t want children are in the minority. Girls grow up with dolls and pushing prams and there is a certain unspoken expectation that they grow up and have their own kids. I was no exception. I grew up with that expectation of myself. Hell, at 20 I’d even picked out kids names with my then boyfriend (cringe). Because that’s what girls do. I thought I’d follow the path of meeting a boy, getting married, living in a semi detached house with a garden, having kids, and going for Sunday lunch at my parents’ house once a month. My life now couldn’t be further away from that. The only conventional thing I’ve done from that list is get married. Outside of that I live in a flat, I spend all my money without fail every month, I drink too much, I have hangovers most weekends, I enjoy afternoon naps when I’m at home, I swear like a trooper and I fill all my space with clothes and shoes. I have no room in my life for a child – physically or figuratively. I can only imagine the pain and heartbreak it must cause if one person in a relationship wants something different to the other. It’s so important to set your stall. I don’t think there can be a middle ground with children. And yes, I know that people change their minds. Maybe personal circumstances change, or they meet a new person with whom they want to share the joy of children. So in that respect I can see that the NHS is trying to avoid future heartbreak. But I’m sure, if you sit people down with an assessor or psychiatrist, you can tell the difference between those people who are on the fence and those who are a vehement no. In the meantime women are having to continue with contraception and, in some cases, dealing with unwanted pregnancies, simply because the powers that be think they know better. And it’s not just professionals. Everyone seems to have a view. You get married and people want to know when you’ll be starting a family. Not just people who are close to you either. Work colleagues, shopkeepers, the window cleaner. Worse still, when you say never, the condescending “you’ll change your mind” statement. No I bloody won’t! Now bog off out of my business! The temptation to tell people I’m infertile just to watch them squirm is immense. For the record, I’ve been told I’d make a brilliant parent (aside from the drinking, swearing and sleeping for as long as I like, when I like). I lived with my step brother and sister during my 20s, when they were 18 months and 3 years old. I looked after them, bathed them, cared for them, played with them and fed them. I adored them. But the difference was they weren’t mine. Ultimately they weren’t my responsibility. I was a part time participant when it suited me. The responsibility sat with my Mom and her husband. In truth, I’d love to want children. I think it must be so rewarding. Seeing that tiny hand curl round yours, a smile that lights up when your child looks at you, or the cuddles and kisses just for being there. But I don’t want it. None of that is enough to make up for giving up the life that I’ve chosen for myself. That’s not being selfish. That’s being self aware. Besides, you wouldn’t question a woman about the fact that she chooses to have children. You wouldn’t ask a pregnant woman if she was sure, or what would happen if she changed her mind. You wouldn’t try to cajole her by telling her she’d make a bad parent. So why is it acceptable the opposite way around? Maybe, just maybe, the NHS should start giving women the credit that they’re due, rather than treating our independent thoughts and beliefs as silly hormonal confusion and brushing them under the carpet. Interesting article. I can’t help but think that, as you said about the future, the people that change their minds might have more backlash for the NHS than people who are simply annoyed at having to use contraception. 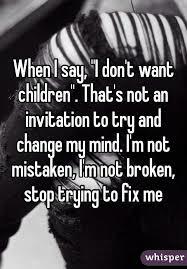 I completely understand that some don’t want children. However, I think under 30 is a risk to both parties, due to future plans and life changes (I hear early 30s is usually when the I-need-a-baby kicks in?) so even if people are absolutely certain now, they still might change their minds. I think it’s a tough one to call and wouldn’t want that responsibility so kind of don’t blame them. I do agree that people are bloody condescending when you say you don’t want them though! Same with marriage! I do see the reason in some cases and I agree with you about an age limit. The world is so bloody judgemental when we don’t conform to “the norm”! I know. I find it strange how anyone at all can ask you such personal questions, but hen to judge your answer. Why does it mean so much to other people? Great article. I understand the NHS wanting to protect themselves however, it is a pain to a) justify your choice for your life and body and b) jump through hoops. And being spoken down to like you don’t know your own mind! Yes! Like I didn’t get this far in life because I have a brain! Thanks so much Lisa. I can’t believe that man said you’re not a real woman! What an idiot. It takes more sense and courage to decide that you don’t want to do something just because most other people do. Knowing your own mind is a strong and admirable quality, and having a baby just because “it’s the done thing” would be tragic. There are so many neglected children around and I can’t help but think in many cases it’s because there wasn’t enough thought put into the implications of having a baby and being responsible for another human being. Great blog piece…and one I could have written myself! 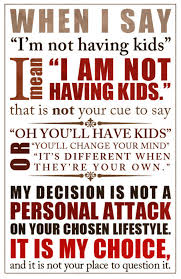 I hate that I have to justify choosing not to have children to people, although those closest to me are supportive of our choice. I do worry about the future; hopefully hubby and I will have a very long and healthy life together but one day one of us will have to cope alone. A care plan for the future though is not a sensible reason to have kids if that is the sole reason. Good point there; that’s another thing people say (” who will look after you when you’re old”) So what, I’m supposed to give birth to and bring up a child just to future proof my old age. Great reason to bring a human into the world. Forget love and nurture, I just want someone to put my socks on when I can’t reach my feet anymore. Ridiculous! Glad to hear you’re supported by those close to you. It must be awful when you get family pressure. I don’t think the government should decide who should or shouldn’t have kids, goodness knows the criteria they’d use. 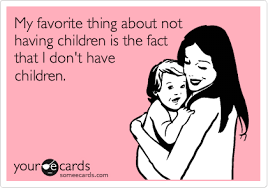 But personally I’d like to see only people that really want children have them. Social pressure & its just what you do are terrible reasons to have children. I have 4, we wanted 4 to 6 (large family dynamic) but I don’t think anyone should be pushed. But I’ve seen families especially torture people into having kids. It’s your decision, its your life! I have written almost the same on a number of occasions. I have not maternal instinct, I have no ache and the only thing baby related I like is looking a baby clothes but I usually think they’d look cute on cats! 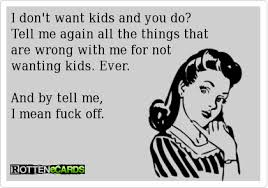 No one seems to understand the no I don’t want kids, they give that pitying look and say one day! No, not one day, not now, not ever. It’s the patronising and pitying look that says “you clearly don’t know your own mind” that really annoys me!